Circuit Rider CZ: Stage 3 completed! 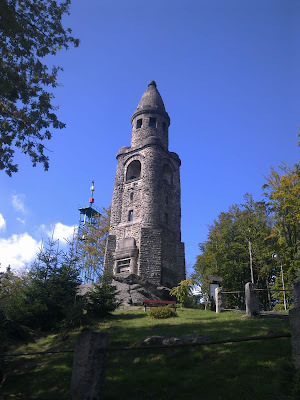 Pictured is the viewing tower (yes, another one) on Haj (pronounced "high"), which stands - ahem - high above the town of As in the northwestern corner of the Czech Republic. It marks the end of stage 3 of my jaunt around the Czech border. I'm now on the long slow train back to Prague for a well-earned rest. Stage 4 starts in spring 2011. All along the watchtowers... Well done Simon. It seems that you did not get a bit of rain on the whole trip! Great work and I'm looking forward to joining you on a sage next year. No, not a drop of rain fell this time. Roll on the spring!